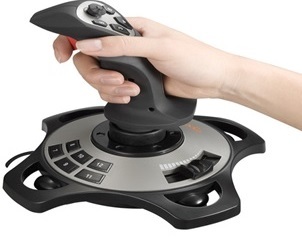 This page covers advantages and disadvantages of Joystick. It mentions Joystick advantages or benefits and Joystick disadvantages or drawbacks. A Joystick consists of small vertical lever (i.e. stick) mounted on base which is used to steer screen cursor around. Most of the joysticks select screen positions with actual stick movement; others respond to pressure on the stick. The figure-1 depicts joystick. Some joysticks are mounted on keyboard; others function as stand alone units. The distance from stick's center position to moved position is proportional to screen cursor movement in that direction. Potentiometer is mounted on base of the joystick which measures the amount of the movement. This potentiometer helps in returning stick to its center position when stick of joystick is released. One or more buttons can also be programmed to act as input switches to signal certain actions once a screen position has been selected. ➨It is useful for playing computer and video games. ➨It is very easy to use by beginners. ➨It is very fast interface. ➨It is easier to navigate. ➨The control is in 3D (three dimensions). ➨They provide fast interactions as required in most games and hence used in games such as racing or flying styles etc. ➨It is difficult to control the ON screen pointer compare to mouse. Some people find it more difficult to control than mouse. ➨Movement indirect in plane different from the screen. ➨They are not robust and can break if too much force is applied on them. ➨It requires lifting of hand from keyboard keys and requires different hand movements. ➨The prolonged use of joystick can cause fatigue in the arms.